I had crossed over from the Tote Road north of Massey to the Westbranch north of Webwood on my journey home. I had spent the day exploring logging roads looking for future photo opportunities. As I traveled south, the evening was wearing on. The lighting getting warmer losing that harshness that is common most of the day. As I crossed a bridge my eyes caught the lighting on this particular scene. The wind was calming allowing for reflections. The sunlight was coming from the right of me as I set up my tripod on the bridge. The location of the sun was creating sun flares on the lens. I retrieved my Tilly hat to act as a blocker. Thus holding the hat with one hand and the other to press the shutter button I was able to accomplish the above composition. What is interesting here is how the sunlight highlights certain parts of the scene. There is a lot of softness here with the earth tone colors. There is a quietness to be found here that gives one peacefulness that is very relaxing. 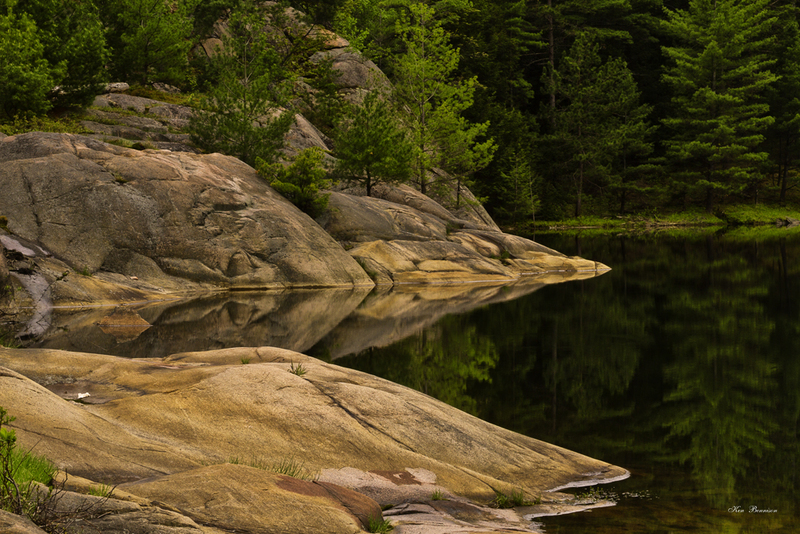 The La Cloche Art show opens next Friday evening July 3 and runs through to July 12. I myself will be there Friday, Saturday, Wednesday and Sunday. If you are in the area stop in and enjoy an excellent art show. Until next time happy trails. June 24 dawned misty and cloudy. Maureen and I drove into Wawa to the North of 17 restaurant for breakfast. The day cleared up. So that evening we drove back down the Gargantua Bay Road. As I drove along a weasel ran out in front of us to then disappear back into the woods. Upon arriving at the parking I loaded up my camera gear. Our aim was to hike the two km trail into the back of Gargantia Bay. The Ojibwa people had built a road here, so the going was very good. There was soon an onslaught of the mosquito population to annoy us. We soon arrived at the bay’s end. We were greeted by a young couple and there two young children. They were set up at one of the campsite available here. There was a nice sandy beach here, but I saw nothing of interest to photograph . The Ojibway had constructed a longhouse on the beach from were they performed their religious ceremonies. The longhouse consisted of saplings fastened together. It was quite sturdy looking. We chatted with the campers for awhile. They suggested that we hike up the hill to a lookout that gave a view of the bay to the North. Picking up the lookout trail at the end of the beach, we were soon sweating as we made our way up the steep hillside. Upon arrival we were greeted to a magnificent view looking towards the Devil’s Chair. Descending the hill back to the beach I headed over to the Ranger’s cabin. It had seen better days as the walls had been removed for an open air effect. I suspect that people had taken free firewood. We bid the campers goodbye and picked up the trail to the parking lot. I swore the mosquito clan had brought in more reinforcements as they seemed to be thicker. It seemed at times that my hands were covered with these pest. We arrived back at the parking lot. Arriving back at the highway I suggested that we go to Fenton Lake. Maureen dropped me off at the side of the highway. I suggested she go to Wawa and stop at Tim Horton for a coffee. Meanwhile I set up my tripod and Canon 7D to capture the above photo. As I was waiting the wind calmed down. The could cover changed to what you see in the above composition. I needed depth so I put shoreline on both sides of the composition. The cloud cover is shown to its best effect. There is lots of depth here. The island is visible. A typical Northern Ontario scene in the Boreal forest. Maureen soon returned with her coffee. I packed my gear away. It was getting dark now. It was time to head back to camp. The 37th Annual La Cloche Art Show concluded yesterday with recorded sales. There was an excellent turnout of artist and the public.While that is it for now Until next time happy trails. It was late Sunday afternoon when I turned off Hwy 144 North of Onaping onto the Chicago Mine Road. It was a beautiful sunny day with cloud cover. The wind was minimal. I drove past Windy Lake Provincial Park. It seemed to be closed for the season. There are a number of small lakes along this stretch of road. I was heading to the Ladder on John’s Creek. It is located off of Fox Lake Road. As I drove along I spotted the above scene on the far shore of a small lake by the road. The lighting was beautiful and it was fairly calm water with the slight ripple. I set up my tripod. Mounted my Canon 7D. I switched to the Canon 70 to 200 L Series lens. My objective here was for a tight vertical shot without overloading the composition. Keep it simple. We have a lot of vertical lines here in the form of tree trunks. They add a grey cast to offset the greens and yellows. On the shoreline there is a nice clump of shrubs growing to give depth. The sun is to the right and as it is getting later in the year it is much lower to the horizon, allowing for some very good lighting. The sun is casting light on various parts of the scene. I used only a small portion of the reflections for a better effect. What you have here is basically 1/3 water and 2/3 forest. This is like taken a pair of scissors and cutting out the part of the scene you want. I have added a new print available for sale. It can be found in the Fine Art Prints section on my blog. I will be set up at the Anderson Farm Fall Fair in Lively Ontario this coming Saturday. The composition above is a dramatic micro scene that can be found in and around waterfalls. You have to look close to find them. They are something to behold. Keep a sharp eye out. On Saturday May 11, I will be at the Rubber Boots Festival in Noelville , Ontario. 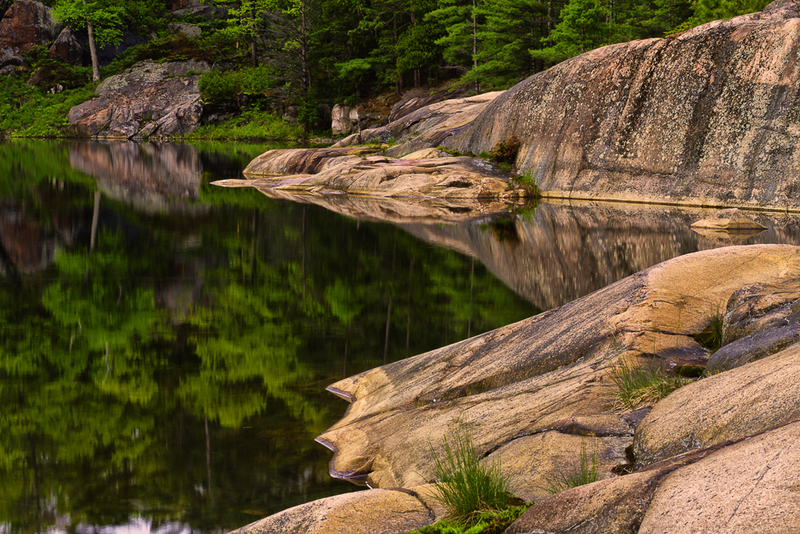 As I travel through the many lakes in Killarney Provincial Park,I am always on the lookout for various rock structures along the shoreline.The right combination to create a pleasing composition are not common.But with a watchful eye you will find these rocky shorelines.Also a quiet evening or morning gives the total reflection and some very neat patterns.Look at this as a geometric pattern. Mid day creates harsh lighting on the rock surface.Evenings the rocks can take on a totally new look with the soft lighting available.The detail in the rocks become intensified.The above photo emphasizes the rock structure.By placing the first point in the foreground to show the texture of the rock,leave a space of water for the reflections that added very interesting patterns and also to tie everything together.The dark background of evergreens creates the sharp contrast with the rock points. This next photo was created by turning the camera 180 degrees and photographing from the opposite direction.Again placing the first rocky point in the foreground with some green vegetation for added contrast.A span of water for your reflections to tie it all in.I also like it when the evergreens reflect into the water for that added depth.So by standing in one spot you are able to capture two very nice compositions.So next time out on the water watch for those unique rock structures along the shorelines and come back when the lighting is right. Well that is it for this week.I am counting down the weeks now until my first trip back into the park.Spring appears to be here now.So until next time happy trails.